back in April during my soccer game I landed on my left heel and felt strong pain right away. I applied ice and 'rest' for a week and then went back to work (PE teacher). It has been 6 months now.. I have less pain but I am not able to run. I have gotten xrays; MRI; been to physio therapy; podiatrist; massage; acupuncture; chiropractor; and finally recently to orthopedic surgeon. The surgeon did not see any issues on MRI. he suspects it might be fat pad contusion He ordered using boot for 3 weeks. I am doing that right now. It has been a week. Pain is going away when in the boot but i have tried stepping on it without the boot ... still painful (not as much though). I have to admit in these 6 months i ve been working as PE teacher traveling and trying to run and play soccer through pain. Finally a week i decided to just give my foot a rest. Even during work now i am sitting on the chair. 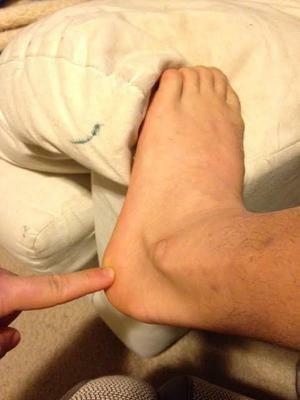 Symptoms: ankle feels tender on the outside, i can walk but if plant on the outer edge it hurts; it hurts to shoot a ball as i plant my left foot; i also have been getting a tingling sensation my ankle and numbness in my leg around calf ( but that could be from being on my feet 8 hours a day as PE teacher). Doctor, any suggestions on what could it be or what could help. THANK YOU! and sorry for a long write up. of the bone on the bottom outside section of your heel. Bone is what is going to cause pain, not fat. However, the connection with the fat pad is that fat is supposed to protect the bone on the bottom of the heel. In your accident you came down in such a manner that you blunted the bone and the fat pad was of no value. The reason you feel better in the boot is because the boot more than likely is forcing all the fat underneath the heel and thus is cushioning the bruised bone. You might actually be able to get away with strapping of the heel with tape in what is known as a low-dye strapping. Part of the taping goes around the heel and essentially forces the fat back under the heel to cushion the bruised bone. It should be mentioned here that when you step down, when any one steps down, the fat underneath the heel disperses laterally, or away from the bone it is meant to cushion. So with a low dye strapping you can accomplish the same thing as the boot, but will give you more mobility. Any podiatrist or physical therapist will know what a low-dye strapping is. It would be worth your while to try it, because if it helps it will allow you to return to most of your activities. By your own admission you are getting better even though it has been six months. As I have stated dozens of times on this site, foot pain always takes longer to heel than other body parts simply because every time you step down you essentially are re-injuring the injured area and therefore the healing process is slow. The good news for you is that the MRI was unremarkable and so there is no serious damage done and you should continue to improve. Thank you so much Doc for a quick and thorough response! Today my foot got tingly and I felt some burning as well as numbness. Are these normal symptoms? A friend told me he had similar symptoms and got misdiagnosed. He had thrombosis after spraining anckle. A clot moved up to the heart. Should I check it out ? I have seen a thrombus of the ankle region, where as in most cases clots start in the heel. I would "guess" you do not have one, but that is something you need to discuss with a doctor that can actually examine you. As far as the taping goes, first walk around and see if you are comfortable, if so, then you might be able to start some light running, it's all trial and error.